Jake Smith is back. Now in private practice with his own PI firm. He tried to keep a low profile and didn't contact any of his old acquaintances. He's ousted at the murder scene, running into most the people he was avoiding. 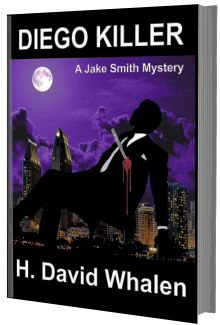 Smith had done a couple of background checks for the dead man, and the day after the body was found, an unknown woman walks into his office. Desperate for money, Jake takes the job. It turned out far more than he had bargained for; competing with the local SDPD and numerous Federal agencies racing to find the killer. Racketeering, drug cartels, alien smuggling, laundering money... and just about every crime you can think of comes into play on both sides of the International border. Jake Smith is not immune to the wrath of the Mexicans. is only part of the adventure. Twists and turns everywhere. Only the diligent reader will find all the clues. You won't put this book down until it's over! “Who?” the assassin queries. He did not have to ask. It is clear they both know. The two men raised their tequila shots and down them. The joy swells inside the assassin. He had been looking forward to this for a long time. “What about his partner?” Hoping for a twosome. “Consider it done!” The Enforcer spins and walks confidently out of the office. It started when his boss called him to his office in early summer in nineteen seventy-three. Back at his current hotel room, he phones San Diego and sets up a late night meeting. He gathers his tools of the trade, fills a black-leather satchel, and throws it on the unmade bed. The Enforcer walks to the closet and searches for the appropriate outfit for the evening’s activities. The killer chooses black dress shoes, a black turtleneck pullover, and black dress slacks. He takes his ensemble to the washroom, where he showers and shaves. After dressing, he grabs a dark-blue, almost black sports coat from the closet and heads downstairs to his De Ville. A ragtag teenager guards his vehicle. He hands him an American fin. The car never needs looking after. The underbelly of Tijuana is well aware of the mid-night black Cadillac and gives it a wide berth.